Morning: chanting of refuges, precepts, reflections & aspirations. Evening: chanting of refuges, precepts, reflections & aspirations. Read a verse of the Buddha Vacana. Give to whoever asks during the course of the day. (Evening) 15-minute brahma-vihara or heart practice meditation. Aditthana 1: I will not intentionally view any images or otherwise expose myself to any media that inflame lust. Aditthana 2: I will not intentionally view any images or otherwise expose myself to any media that inflame hatred. Morning Sit: 50-minute formal, seated recollection of the brahma viharas and anapanasati. Drink a cup of tea and do nothing else but drink and watch the arising and passing away of thinking. Evening Sit: 35-minute formal, seated radiation of metta and anapanasati. Chant the Karaniya Metta Sutta. Aditthana 3: I will not eat after 8pm. 10 minute grounding meditation before using any media in the morning. Use my mala while commuting or walking outside to internally repeat the one of the traditional metta phrases. 25-minute metta bhavana using the traditional phrases above. I wish it were a simple question. 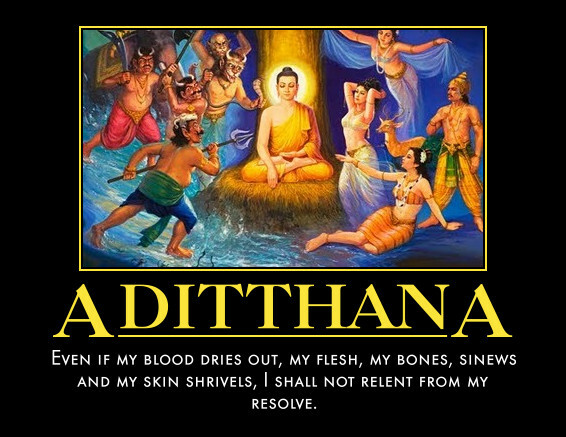 In the case of brahma vihara it means” Divine”.